This chapter provides several background concepts, the context, as well as some terminology and motivations for the material discussed in the rest of the book. In particular, we discuss block ciphers, a fundamental cryptographic primitive which plays a major role in safeguarding sensitive information. 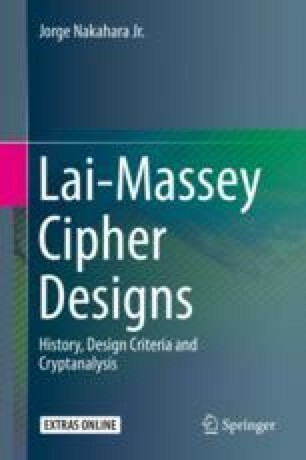 Among the several kinds of block ciphers, we focus attention on ciphers that follow the Lai-Massey design paradigm. The first such cipher was the Proposed Encryption Standard (PES) designed by X. Lai and J.L. Massey in 1990, followed by the International Data Encryption Algorithm (IDEA) by the same authors and S. Murphy in 1991. Moreover, other ciphers that appeared afterwards are also described such as the MESH ciphers. In particular, their history, motivation, design criteria, how they differ from other Lai-Massey designs and the attacks known so far are also described.